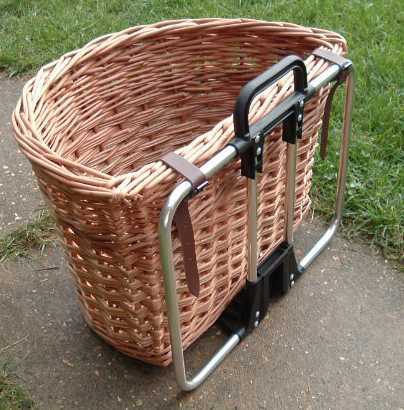 This basket is designed to fit the Brompton front luggage carrier frame which in turn fits on to the luggage carrying block on the front of the Brompton. As such, it fits exactly like other bags on the front of the Brompton and can easily be removed from the bike like any other Brompton luggage. Two straps are enough to attach the basket to the frame. The basket also rests on the lip at the bottom of the bracket. When you pick it up by the frame handle, the basket comes along with it. The basket is 400 mm wide and 300 mm tall, which makes it a good fit on the frame. The length is approximately 250 mm, that being the distance it projects forwards from the frame. 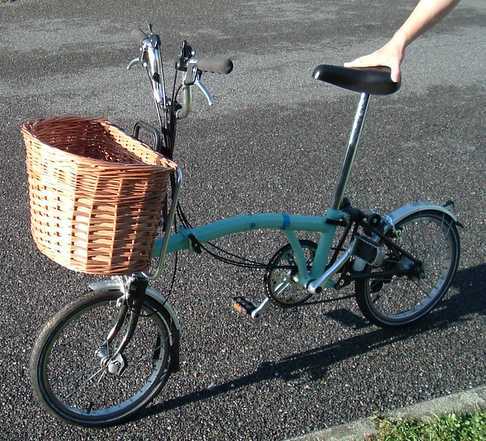 The above sizes are correct for the majority of Bromptons, but the S-type Brompton has a slightly shorter frame height of 26 cm. 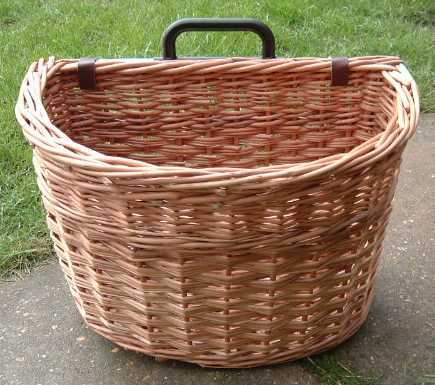 If you have one of these, please let me know and I'll make the basket the correct size for your bike. If you are at all unsure, measure the frame anyway. I do not supply the frames, which are a standard Brompton part and can be bought from your Brompton dealer. We can also supply suitable tyres for the Brompton, click here. To see more baskets, follow the links below.